...1964 Nissan Patrol with snow plow. Engine needs work. Call 520-029one. 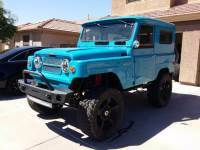 ...Seller's Vehicle Description 1965 Nissan Patrol. Starts, runs, and drives. 60% restored. 4 liter straight 6 engine. Rare vehicle. ...1965 Nissan Patrol. Starts, runs, and drives. 60% restored. 4 liter straight 6 engine. Rare vehicle.